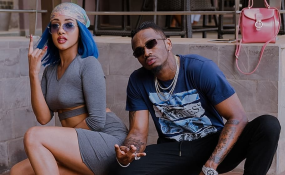 Tanzanian singer Diamond Platnumz has vowed that his love for Kenyan girlfriend Tanasha Donna is stronger than ever and he is never going to cheat on her. The 'Jibebe' hit maker made the vow on social media while commenting on a picture posted by Tanasha. "Roho Yangu Mie,... Nakupenda Mpaka nakupenda tena... ..Najua wanasubiri lini... .ila Watasubiri sana! Sikucheat hata iweje!" wrote Diamond. The two lovers have been inseparable since making the relationship public last year. Tanasha is reported to be making numerous weekend visits to Dar es salaam just to be with Diamond. Diamond's philandering ways was the reason be got dumped by Ugandan Socialite and the mother of his two children Zari Hassan last year. His loose zip was also a major talking point in his short-lived romance with Tanzania model Hamissa Mobetto.